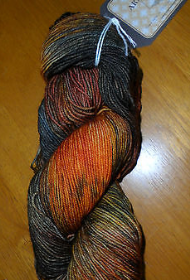 This gorgeous new yarn from SMC is 93% acrylic and 7 other fibres (the reflective thread that run through it). 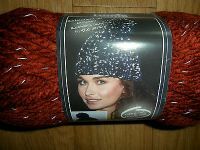 It is wonderfully soft and luxurious and knits up really quickly being so chunky. It is light reflective. The thread which runs through it lights up if light is shone on it eg. a photo, car lights, neon lights, etc. Great for children (or adults) walking home in the dark or glowing in ultra violet lights. If you would like further information, please do not hesitate to email me. Price is for one 150g ball which knits approximately 75 m. Further balls can be purchased at additional cost and all balls supplied will be of same dye number.